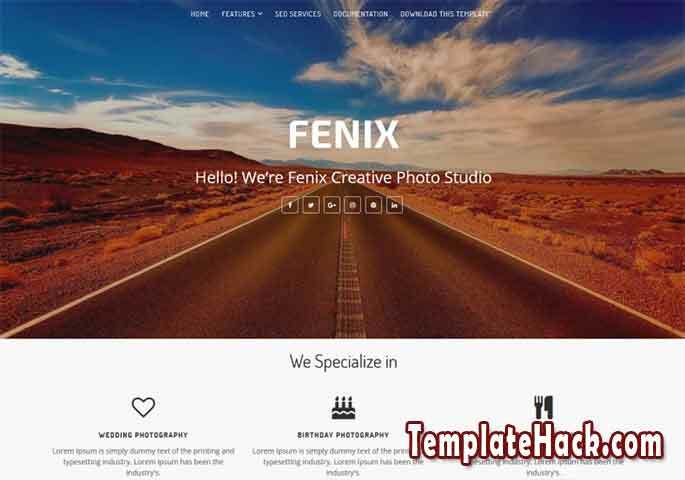 TemplateHack.com - Download Fenix Creative premium blogger template. Fenix is creative business blogspot theme that enables you to craete a professional portfolio from your blog online. This template designed for professional freelancer, designer, content writer, photographer to make this portfolio profile or cv online. Fenix creative premium blogger theme designed with a wide variety layout with amazing looking and widgets on homepage. This template also coming with 100% responsive design and compatible with any screen size device. No sidebar, slideshow, 2 columns, ads ready, post thumbnails, clean, SEO friendly, landing page, elegant, browser compatibility, responsive, mobile friendly, drop down menu, slider, white, clean, minimalist, social bookmark ready. Business blogger template, photography blogger template, photo blogger template, portfolio blogger template, profile blogger template, personal blogger template, curicullum vittae blogger template, cv blogger template, magazine blogger template.